At a stunning size of 12″ x 14″ (30.5cm x 35.5cm), and with full spread images spanning 24″ in width, this first book of a new fiction series will open the doors to a parallel history of racing. Daniel Simon designed for Bugatti, Lotus, Formula 1 and penned unforgettable vehicles for Hollywood movies like Tron: Legacy or Oblivion. This is his second book after Cosmic Motors. Simon will present in this series over the next years fictitious racing machines at impeccable detail up to 50 megapixel, including vehicle specs and maps of the tracks they raced on. All vehicles and characters are explained through the carefully written story of racer Vic Cooper, who time-travels to the past and the future to compete in the most challenging motor races between 1916 and 2615. This is episode 1, the year 2027, written in English, French and German. Design fans, car enthusiasts, CG addicts and science-fiction aficionados can enjoy Simon's parallel world through hyper-real renderings, drawings and photography of fictional drivers, managers and beautiful women. This first episode puts three uniquely designed race cars in the spotlight: The 1981 Masucci X-5 and X-6, the 2027 Masucci X-7 and the 2027 Prideux -Martin MF/27. The foreword has been written by racing legend Jacky Ickx, who raced in the 1960s, '70s and '80s for many famed teams such as Ferrari, McLaren, Porsche, Brabham or Lotus. He is the only driver to have won in Formula One, Can-Am, Le Mans, and the Paris-Dakar rally. UPDATE: The PITLANE edition, as well as personalization of the limited version, are no longer available. Categories: Books, transportation design. Tag: daniel simon. 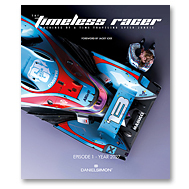 The Unlimited Edition (also referred to as the trade or standard edition) is a large 12″ x 14″ hardcover book and is a great start to dive into the world of The Timeless Racer. Three languages inside: English, French, and German. The cover is finished in Simon’s preferred soft touch / metallic foil lettering and arrives shrink-wrapped. This Limited Edition is the start to a collectable series, and its bold slipcase makes it a great coffee table book. The large 12″ x 14″ book and its slipcase come in Simon’s preferred soft touch / metallic foil lettering finish, with a unique cover art. Three languages inside: English, French, and German. Start your collection now. – Only 1113 available worldwide! Come explore the vehicle designs of a far away galaxy called Galaxion where futuristic concepts exist in everyday life. Nine different spaceships, pods, race cars, giant trains, warships and balloons from various planets of the Galaxion system are shown from concept to completion. Daniel Simon is an established car designer who has spent the last several years focusing his talents on futuristic concepts for such automakers as Bugatti and Lamborghini. 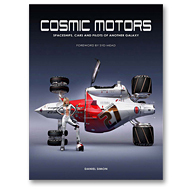 In his first book, Cosmic Motors, each chapter shows the design process of a unique vehicle, from the first ideation sketches to the stunningly detailed 3-D models to the final photorealistic full spread renderings. Join Daniel in this virtual world of visionary vehicles!